Either if you’re looking for a rock bar to get chilled and have a couple of beers or you’re in the mood to head for the glitzy dance party, you will not be disappointed - Nightlife in Istanbul is huge! There are many popular establishments in different parts of the city. 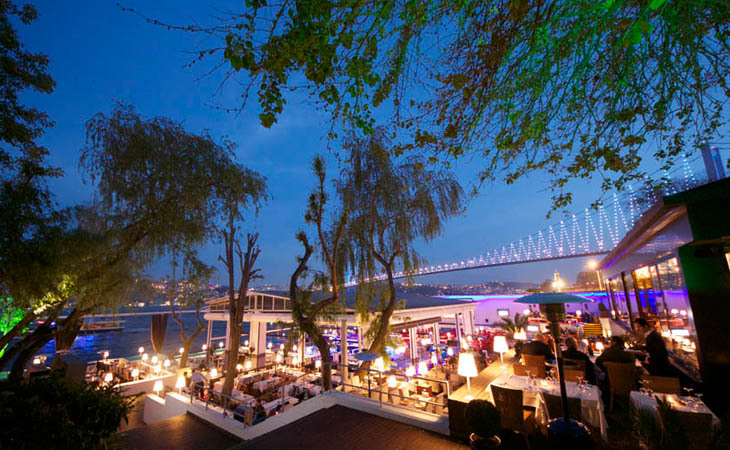 Either if you’re looking for a rock bar to get chilled and have a couple of beers or you’re in the mood to head for the glitzy dance party, you will not be disappointed – Nightlife in Istanbul is huge! There are many popular establishments in different parts of the city. Kadikoy’s Kadife Street, referred to by locals as ‘Barlar Sokak’ (‘Bar Street’), is one of the most popular nightlife districts on the Asian side of Istanbul. It lays near the harbour of Kadıköy (Turkish: Kadıköy Iskelesi), a step away from the old residential area Moda. İn this narrow street you’ll find charming bars, hard rock pubs and colourful garden venues. Prices are moderate and people are layed back. Some of the best bars on the street include Hera, Arka Oda, Isis and Karga. You can also ask fort he “küçük barlar sokağı”, which is the little brother of the “Bar street” and just some steps away. Here you may want to enjoy some life music at the Shaft Bar. Again in the Kadıköy district the Bagdat Street is not just famous for its extensive shopping opportunities of various international fashion brands during day time, but as well with its collection of western style bars and designer pubs, fashionable locals like to have their drinks in between restaurants and cafes. You won’t find nightclubs here, but have the opportunity to have one or too nice drinks in European atmosphere. Ortakoy is the place fort he hot parties. Istanbul’s rich and famous people can be seen here dancing till the morning hours. Prices are high and so are the shoes of the ladies, moving restless to the latest Turkish pop songs or Techno music. Amongst the most popular nightclubs you will find Angelique, Vogue, Sortie etc. Undoubtedly the most popular place to go party or just to have a drink is the Beyoğlu district, with its Istiklal street, Asmalımescit area and Nevizade street. Just opposite the historic Tunnel station at the one end of Istiklal street you enter the charming area of Asmalimescit. This place is packed with restaurants, meyhanes and bars, each with their own unique character, embedded in the atmosphere of old buildings. Students, tourists, intellectuals and artists come here to have their drinks alongside with nice chats and some music for all tastes. If you’re looking for an evening where you can enjoy delicious and authentic mezes (Turkish tapas), along with live Gypsy music in an unique atmosphere of a joyful crowd, Nevizade is your place to be. The Nevizade street is next to Balik Pazari (Fish Market) on Istiklal Street, behind Cicek Pasaji (Flower Passage). Here Meyhanes – Turkish Taverns- are lined next to each other, with an assortment of mezes, fish and meat dishes. While sitting at one of the the outdoor tables you will feel sitting in the middle of the pulse of the city. Other popular places in the Beyoğlu area are: Hayal Kahvesi, a bohemian side-street bar with wooden furniture and a full dance floor at midnight. Ghetto is a music lounge, Indigo for fans of electronic, house, techno, and pop music, Kaktüs has many tables outside, Dogzstar Teras is on the third floor, and the terrace bar 360 on the top floor is overlooking the city. The choice is up to you. With its hip cafes, shops and art galleries, the neighborhood once known as the Wall Street of Istanbul has become the city’s most stylish area for nightlife, restaurants and shopping.